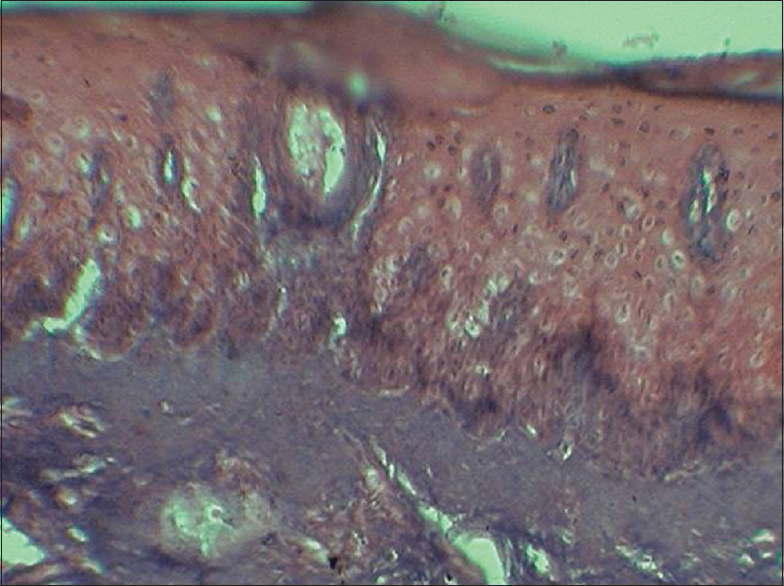 Context: Adequate tissue fixation is fundamental to good quality histological sections. Owing to undesirable effects of 10% buffered formalin, its availability in clinics is questionable. Thus, the present study was conducted with a novel approach to fixation, together with the scope of finding fixative properties of more commonly used reagents available at the clinics. Aims: The present study was aimed to compare the efficacy of local anesthetic solution, normal saline (NS) and distilled water (DW) with that of 10% neutral-buffered formalin. Settings and Design: It is a single-blinded study where histological assessment of fixation was done to assert if the tissues procured were sufficient or insufficient for the clinical diagnosis with/without any problems. Subjects and Methods: Forty soft-tissue specimens obtained from 2 goat tongue were used. Tissues each were directly immersed in local anesthesia, DW, NS solution and formalin for 12 and 24 h each and labeled as Group I and Group II, respectively. The sections were evaluated for staining quality and were subjected to statistical analysis. Statistical Analysis Used: Kruskal–Wallis test was employed to assess the differences in histological quality scores. Comparison between the tissues of the two groups was estimated with Mann–Whitney U-test. Kappa Statistic was used to measure the interobserver variation. Results: There was a significant difference (P ≤ 0.05) in the efficacy of all the three emergency fixatives. Conclusions: On the basis of the results obtained, local anesthetic solution can be used as an emergency fixative. A dental clinician often comes across with patients exhibiting oral lesions in his/her routine practice. Hence, the ability of general practitioners to diagnose a suspicious lesion necessitates a thorough knowledge regarding the application of an appropriate diagnostic aid. Definite diagnosis cannot be solely formulated only on the basis of clinical examination; hence, biopsy procedure for histopathological study becomes indispensable for confirmation of lesion. 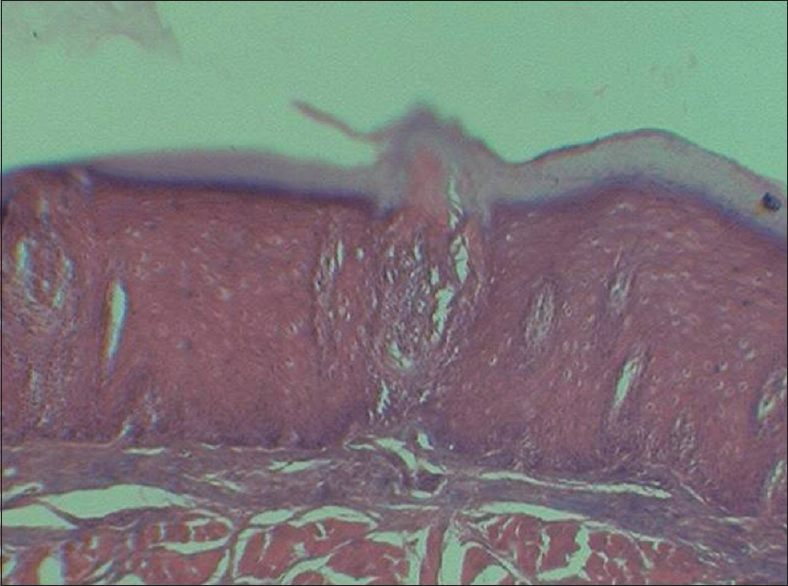 Tissue fixation is one of the most essential determinants for the quality of histological sections. The primary function of tissue fixation is to prevent putrefaction and autolysis followed by its removal from the body, and the changes once caused cannot be redeemed. Formaldehyde, as 10% buffered formalin (4% buffered formaldehyde), is the most widely employed universal laboratory fixative for tissues because of its good results, practicality and relatively low cost. In spite of its extensive use in the laboratory, it is not routinely kept in the clinics owing to its several undesirable effects which include its carcinogenic and irritating potential. Hence, the present study was conducted to evaluate the efficacy of tissue fixation with other regularly found agents in the dental clinic, i.e., local anesthetic (LA) solution, normal saline (NS) and distilled water (DW) as emergency fixatives till the tissue is transferred to 10% formalin in the laboratory. Thus, the study was aimed to assess and compare the efficacy of fixation between the abovementioned solutions in terms of nuclear and cytoplasmic staining characteristics and its applicability as emergency fixative in private clinics. In the present study, two fresh goat tongues were collected from a local slaughterhouse. Forty tissues samples measuring 1 cm × 1 cm were obtained from the same. Five tissues each were directly immersed in local anesthesia, 0.9% NS, DW and 10% formalin for 12 h and 24 h each; labeled as Group I and Group II, respectively [Table 1]. The tissues were subsequently transferred to 10% normal buffered formalin solution for overnight fixation at room temperature. Dehydration of the tissues was done using the graded concentrations of Propan-2-ol followed by their immersion in the clearing agent, xylene. The samples were embedded in paraffin wax, and 4 μm tissue sections were obtained and stained with Hematoxylin and Eosin, using standard protocols. 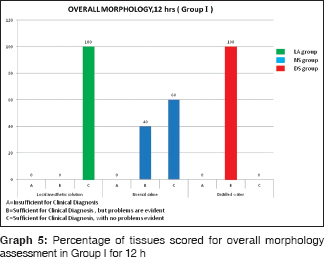 The prepared slides were then subjected to scoring by two oral pathologists individually for the histological assessment of fixation to minimize the subjectivity using the following scoring system with little modification to assert if the tissues procured were sufficient or insufficient for the clinical diagnosis with/without any problems [Table 2]. The pathologists scoring the slides were blinded to the fixation protocol. Differences in histological quality scores were assessed with the Kruskal–Wallis test to correct for multiple comparisons. Comparison between the tissues of the two Groups I and II for evaluating the effect of time duration before they are transferred to formalin in the laboratory was estimated employing Mann–Whitney U-test. Interobserver variation was measured using Kappa Statistic. 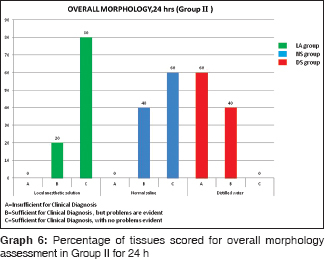 The morphology of the tissue samples was investigated under the subsequent criteria. There was a significant difference (P = 0.0114, 0.0052) in the efficacy of all the three emergency fixatives, i.e., LA solution, NS and DW when compared to each other on the basis of their cytoplasmic morphology in both Group I and II, respectively. 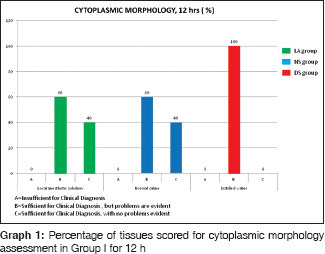 In Group I, 40% of the tissues kept in both LA solution and NS were sufficient to give the diagnosis without any problems whereas 60% tissues posed a little difficulty for formulating the diagnosis when cytoplasmic morphology was examined [Graph 1]. On the other hand, all (100%) the tissues kept in DW caused considerable difficulty to reach to a diagnosis. In Group II, 80% tissues of LA and NS group could be diagnosed effectively with no and little difficulty, respectively, whereas all the tissues obtained from DW group were declared in sufficient to reach any conclusion [Graph 2]. Judging by the aforementioned special criteria, tissues from LA group showed vacuolization limited to basal/suprabasal epithelial layers only [Figure 1]. Whereas, vacuolization was evident in almost all the epithelial layers in the tissues from both NS and DW group [Figure 2] and [Figure 3]. Spongiotic epithelium was appreciated in the tissues from the NS group [Figure 4]. 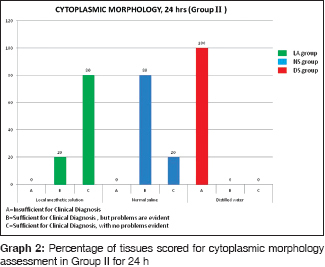 Calculation of results of Kappa Statistic revealed a significant difference in the agreement between the two observers over the results of cytoplasmic morphology of the tissues obtained from NS and DW solutions in Group I and tissues from NS solution in Group II. 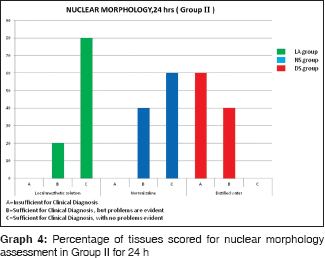 Similar to cytological morphology, the calculated P = 0.0283, 0.0242 for nuclear morphology of the tissues acquired from three fixatives employed illustrated a significant difference in their effectiveness. In Group I, all the LA fixed tissues could be diagnosed efficiently wherein only 60% of the tissues from NS group showed the same results. Meanwhile, diagnosis could not be procured at all from any of the tissues of DW group [Graph 3]. In Group II, diagnosis was effortlessly formulated for 80% of the tissues from LA group; on the other hand, 40% of the tissues from both NS and DW group were just sufficient to be diagnosed [Graph 4]. In addition, the tissues of NS group showed faint nuclear outline whereas the nuclei in the tissues from DW were found to be overstained with the hematoxylin stain. There was a good deal of agreement between both observers in regard to this parameter for almost all the tissues in both the groups. Whereas according to us in LA group, the nuclear staining was very optimal. A significant difference (P = 0.0194, 0.0242) was found in the efficiency of the LA, NS and DW solution in both the groups: Group I and Group II, respectively. In Group I, interpretation of all the tissues from LA and DW group could be easily accomplished with no and little hindrance, respectively. However, 40% of NS group tissues caused a slight difficulty to be diagnosed [Graph 5]. In Group II, 80% of the tissues of the LA and 60% tissue of NS group were adequate enough to be identified; 60% of the tissues of the DW could not be recognized at all [Graph 6]. Furthermore, artifacts such as clumping or the crushing artifact and tissue cracking were predominantly found in the tissues of DW group [Figure 3]. Although there was an interobserver disagreement over the results of the tissues of NS in Group II, the rest of the findings were almost in complete agreement in both the Groups I and II. Mann–Whitney U-test employed revealed that there was no significant difference (P > 0.05) in the proficiency of all the three probable emergency fixatives when the results of each of them were compared among themselves in the 12 and 24 h group. A well-fixed tissue is the key to an effectual interpretation for diagnosis. 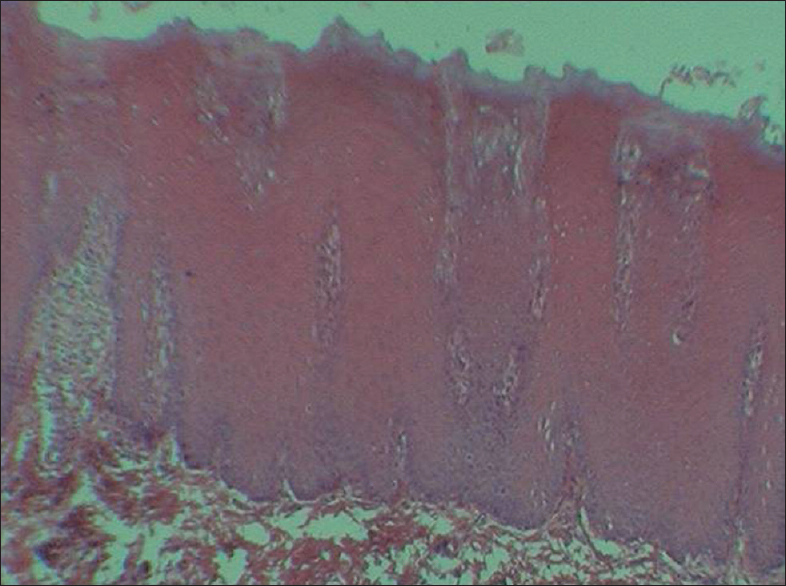 Therefore, fixation remains to be a fundamental step through the process of histology. In surgical pathology, 4% formaldehyde or 10% neutral-buffered formalin has been the “gold standard” fixative which has been in use since 19th century. Since it is highly economical and preserves tissue morphology in long term stored specimens. In addition, it unfailingly allows the use of the routine H and E stains and the special histological stains to be used in a reliable manner. In spite of its many advantages, the safety hazards of formalin remain to a major subject of concern for its routine use in the laboratories. In 1987, it was declared as a probable human carcinogen under conditions of unusually high or prolonged exposure by the U. S. Environmental Protection Agency. The U. S. Occupational Safety and Health Administration stated that employers must reduce worker exposure to formaldehyde at, or below, permissible exposure limits and the time-weighted average which should be ≤0.75 ppm. Since the 15-min short-term exposure limit is 2 ppm, the exposure to toxic levels may easily exceed the recommended values. Thereafter, the use of formalin in the clinics of the practitioners has been largely reduced. Surgical procedures such as incisional biopsy, excision of small lesions and curettage are commonly performed at the private clinics. Hence, this necessitates the requirement of a medium which would preserve the tissues appropriately before it is transferred to the laboratory and eventually fixed in 10% formalin. Local anesthetic solution, NS solution and DW are the regularly used, much safer chemicals routinely available at the clinics. In the present study, tissues fixed in the local anesthesia solution showed plausibly comparable morphological features when compared to the tissues routinely fixed using the “gold standard” formaldehyde. The use of local anesthetic solution as an emergency fixative has not been mentioned in the literature till date. Although a research study was conducted at the Department of Developmental and Cell Biology, California in 1976 which focused on the interaction of LAs with cell membrane, membrane-associated cytoskeletal organization in balb/3t3 cells and also its effects on the morphology on the cells. They concluded that local anesthesia interacts with the membrane lipids (acidic phospholipids) and produces variety of effects which include altered osmotic fragility, inhibition of cell spreading, movement, adhesion and fusion. It might raise intracellular Ca concentrations to levels (>10-5 M) sufficient to induce microtubule depolymerization. LAs are considered to interact with membranes by both hydrophobic and electrostatic interactions in proximity with the anionic groups of acidic phospholipids which might be the possible explanation of its mechanism of action. This gives us a hint that LA could substitute formalin in emergency situations. However, the action of this solution as fixative at molecular level is not clearly understood so further research is required in this direction. Khoo in 1995 and Oliver et al. in 2004 individually mentioned that NS and DW are unsuitable transport media for biopsied tissues and result in poor fixation and artifactual changes., Furthermore, in 2011, Nitul Jain stated that NS solution gives almost no fixation. Results obtained in the present study are in conformity with the aforesaid findings. On the other side, a study was conducted at Department of Dental Basic Sciences, College of Dentistry, Mosul, Iraq in 2010 on three rabbits, which advocated the use of NS after evaluating the capability of saturated sodium chloride solution and DW as a fixative agents. In contrast to their findings, the results obtained in this study showed a significant difference (P ≤ 0.05) between the performance of formalin and NS; thus, the present study does not recommend its use as a fixative. In 1987, Ficarra et al. studied the artifacts produced during the biopsy procedures and found that fixation in water produces severe tissue alterations and makes the diagnostic evaluation of the specimen difficult. When the results were compared, the conclusion of both the studies were in harmony, suggestive of inadequacy of DW to preserve the tissue morphology. There was a significant difference (P ≤ 0.05) when the effects of the DW were compared to formalin. To conclude, fixation arrests autolysis and putrefaction to stabilize the cellular and tissue constituents so that they withstand the subsequent stages of tissue processing. This is the pioneer study which suggests LA solution can be effectively used as an emergency fixative. However, further studies involving its application in diagnosis of dysplastic or mucocutaneous lesion is required to substantiate the role of LA solution as emergency fixative. Moelans CB, ter Hoeve N, van Ginkel JW, ten Kate FJ, van Diest PJ. Formaldehyde substitute fixatives. Analysis of macroscopy, morphologic analysis, and immunohistochemical analysis. Am J Clin Pathol 2011;136:548-56. Zanini C, Gerbaudo E, Ercole E, Vendramin A, Forni M. Evaluation of two commercial and three homemade fixatives for the substitution of formalin: A formaldehyde – Free laboratory is possible. Environ Health 2012;11:1-14. Godkar P, Darshan B, Godkar P. Textbook of Medical Laboratory Technology. 2nd ed. Mumbai: Bhalani publication house; 1996. Chafin D, Theiss A, Roberts E, Borlee G, Otter M, Baird GS, et al. Rapid two-temperature formalin fixation. PLoS One 2013;8:e54138. Paavilainen L, Edvinsson A, Asplund A, Hober S, Kampf C, Pontén F, et al. The impact of tissue fixatives on morphology and antibody-based protein profiling in tissues and cells. J Histochem Cytochem 2010;58:237-46. Occupational safety and health administration. Retrieved from: https://www.osha.gov/pls/oshaweb/owadisp.show_document?p_id=10075&p_table=STANDARD. [Last retrieved on 2007 Jun 29]. Nicolson GL, Smith JR, Poste G. Effects of local anesthetics on cell morphology and membrane-associated cytoskeletal organization in BALB/3T3 cells. J Cell Biol 1976;68:395-402. Khoo SP. Oral biopsy in dental practice – The pathologist's perspective. Ann Dent Univ Malaya 1995;2:29-32. 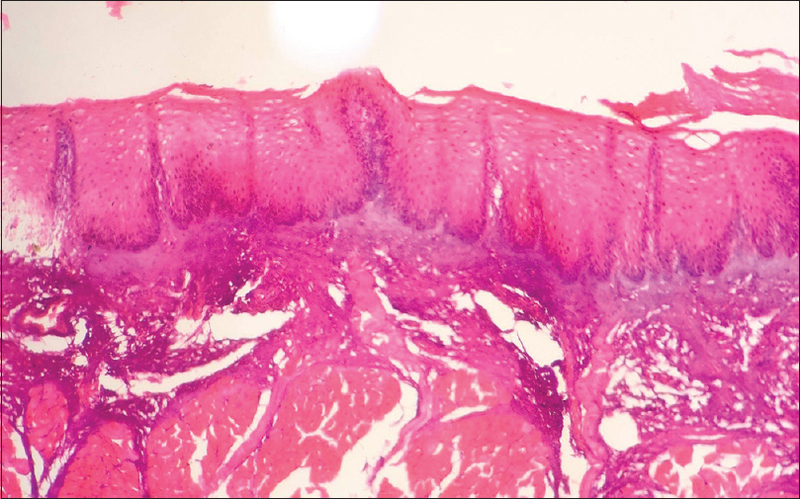 Jain N. Essentials before sending biopsy specimens: A Surgeon's prespective and pathologists concern. J Maxillofac Oral Surg 2011;10:361-4. Al-Saraj A. Use of saturated sodium chloride solution as a tissue fixative. Iraqi J Vet Sci 2010;24:53-8.